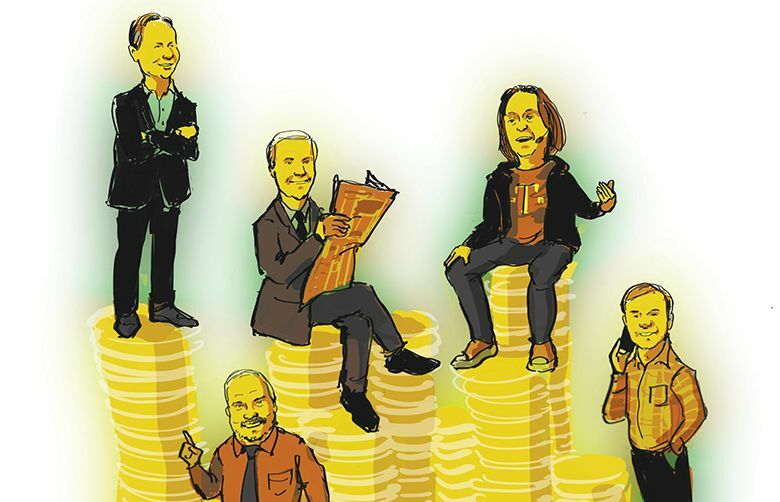 The best paid NW public company CEOs for 2017 include a couple of new faces and three repeats. One longtime top earner is gone, however. 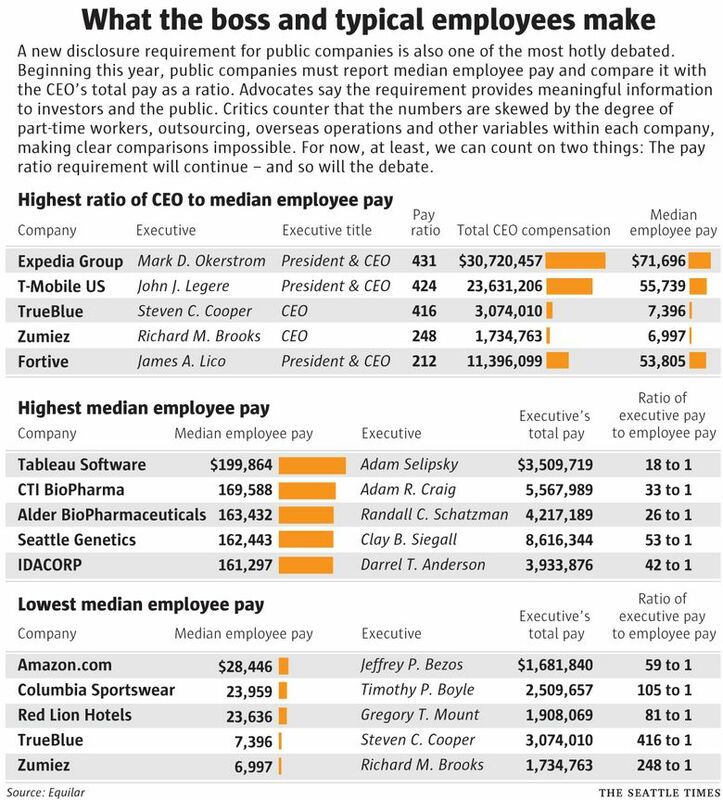 When it comes to CEO pay reports, sometimes timing really is everything. 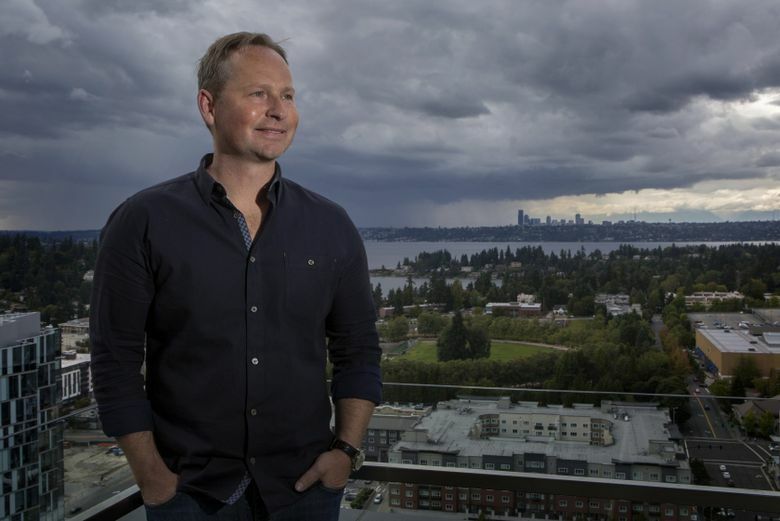 Expedia unexpectedly had to hire a CEO in 2017, and the travel company’s introductory pay package for its new top executive made Mark Okerstrom the best-paid CEO among Northwest public companies last year. Expedia reported Okerstrom’s total 2017 pay as $30.72 million. Most of his compensation consisted of stock and option awards that vest over years and were pegged to future performance targets. 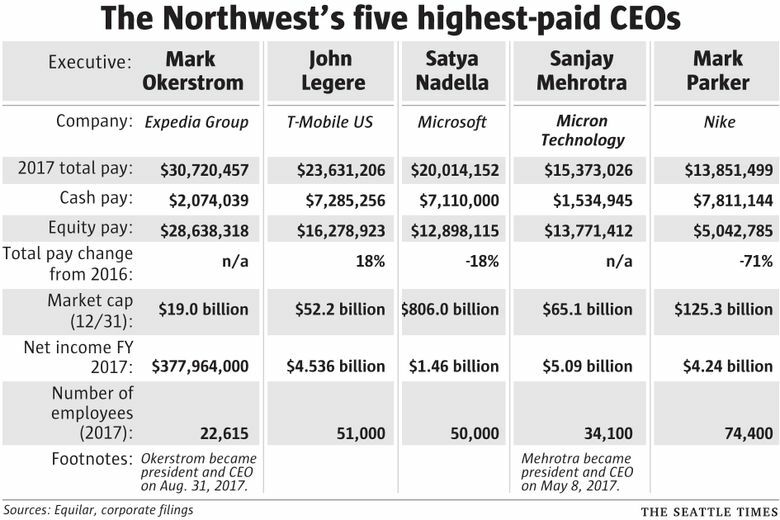 Okerstrom’s pay package also gave Expedia the highest pay ratio among the 94 public companies in Washington, Oregon and Idaho, according to data gathered by research firm Equilar for The Seattle Times. Last year the median pay for Expedia’s 22,152 employees worldwide was $71,696, well above Washington state’s median annual wage of $44,440. Still, the company’s pay ratio was the highest in the Northwest, coming in at 431 to 1. Much of it can be attributed to timing. Last August former Expedia CEO Dara Khosrowshahi unexpectedly left to become CEO of ride-hailing company Uber. The company’s board quickly hired from within by promoting Okerstrom, then Expedia’s executive vice president and chief financial officer and a longtime colleague of Khosrowshahi. 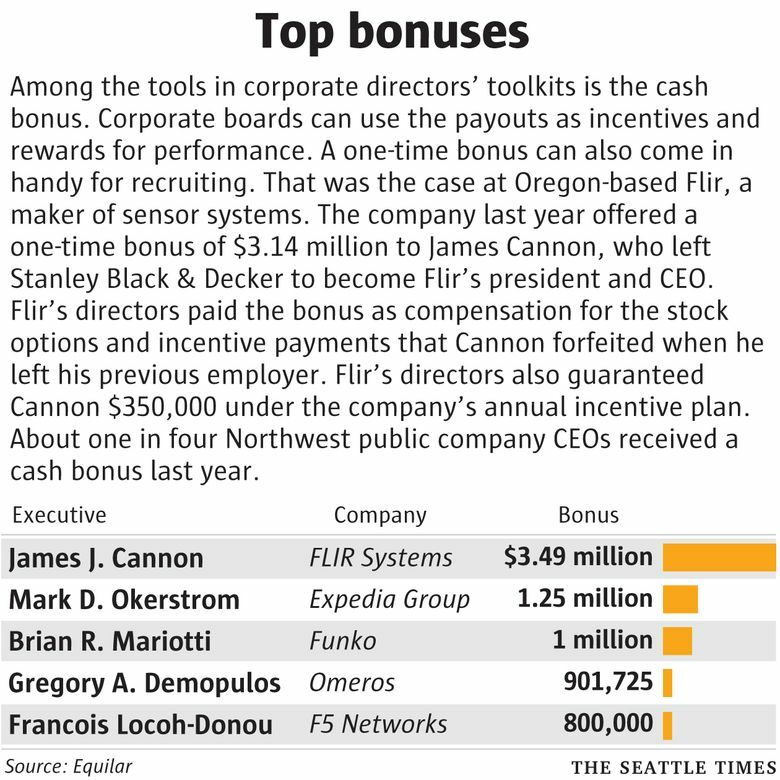 Companies often offer big pay packages to new CEOs, said Fred Whittlesey, a Seattle compensation consultant. But whether the new executive actually gets all of the money that’s reported frequently depends on whether the company hits performance targets in the years ahead. That was certainly the case with Okerstrom’s pay package. Last year the company paid Okerstrom a salary of $824,000 along with a $1.25 million bonus, regulatory filings show. But the lion’s share of his compensation package consisted of stock and option awards with strings attached. His stock options, valued at $25.15 million, vest in annual installments for four years. Three hundred thousand of his options won’t vest at all unless the company’s stock price exceeds $200 for a sustained period before September 2021. Earlier this month Expedia’s stock was trading in the vicinity of $124 a share. The company also awarded Okerstrom stock valued at $3.48 million. But the 25,000 shares don’t vest until 2021, provided that Expedia also hits a stock price or hotel-booking performance target. In other words, most of Okerstrom’s pay is in the future and not assured. “If you look at that total package, so much of that number is speculative,” Whittlesey said. Nonetheless, under federal regulations the company had to record the estimated value of Okerstrom’s entire pay package in 2017. In a statement, Expedia said 80 percent of Okerstrom’s reported compensation consisted of stock awards that were tied to his promotion. The goal was to keep Okerstrom with the company and give him incentives for growing the business. 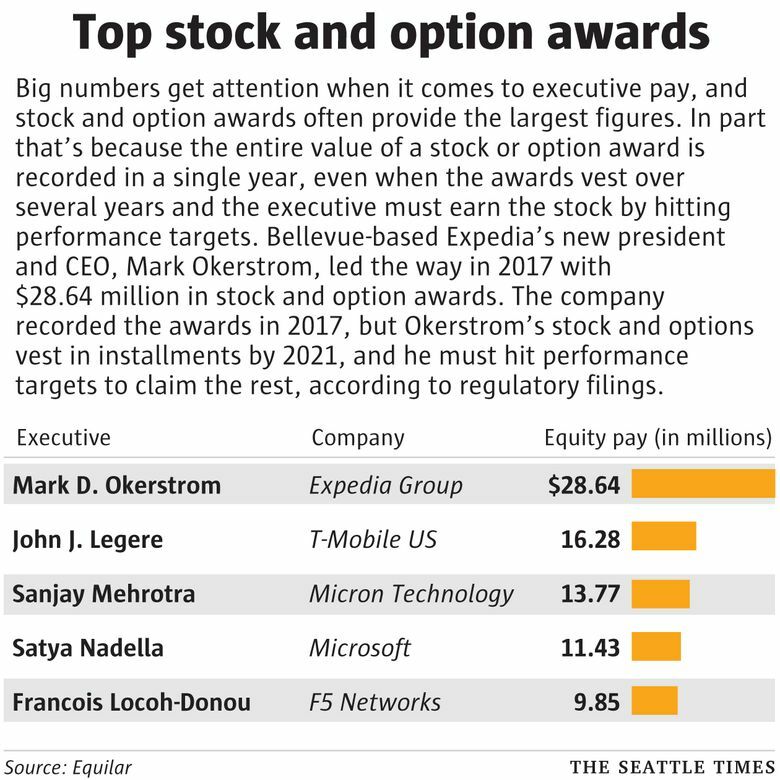 If Okerstrom’s promotion-related stock awards were excluded, Expedia noted, the company’s pay ratio would drop to 85:1. 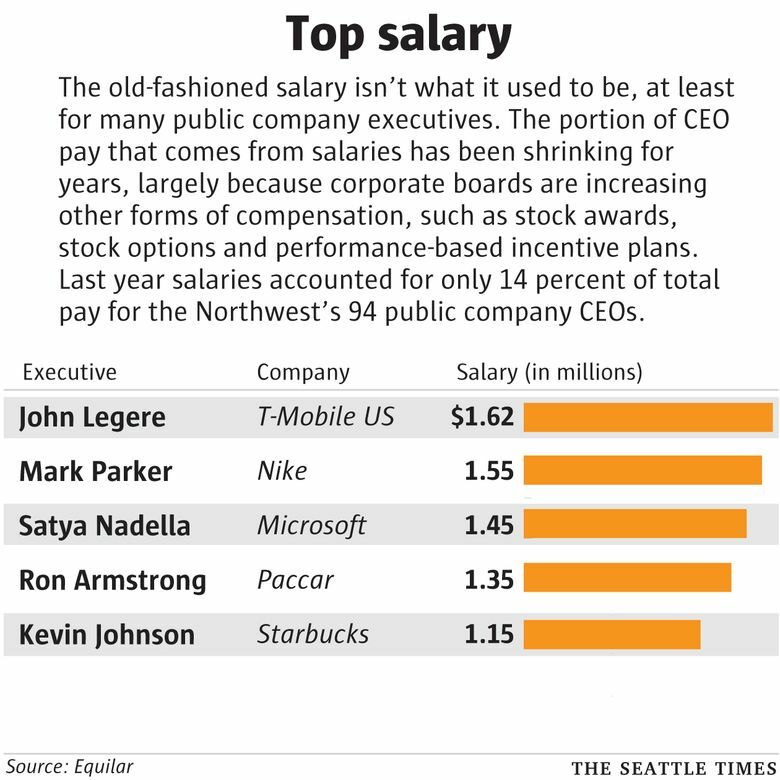 Expedia has led the region’s best-paid-CEO list before. In 2015 the company reported a $94.6 million pay package for Khosrowshahi, which made him the highest-paid CEO in the country at the time. Ninety-six percent of Khosrowshahi’s pay package consisted of stock options that vested in stages over seven years. When he left the company last year for Uber, Khosrowshahi walked away from millions in unvested Expedia stock options. 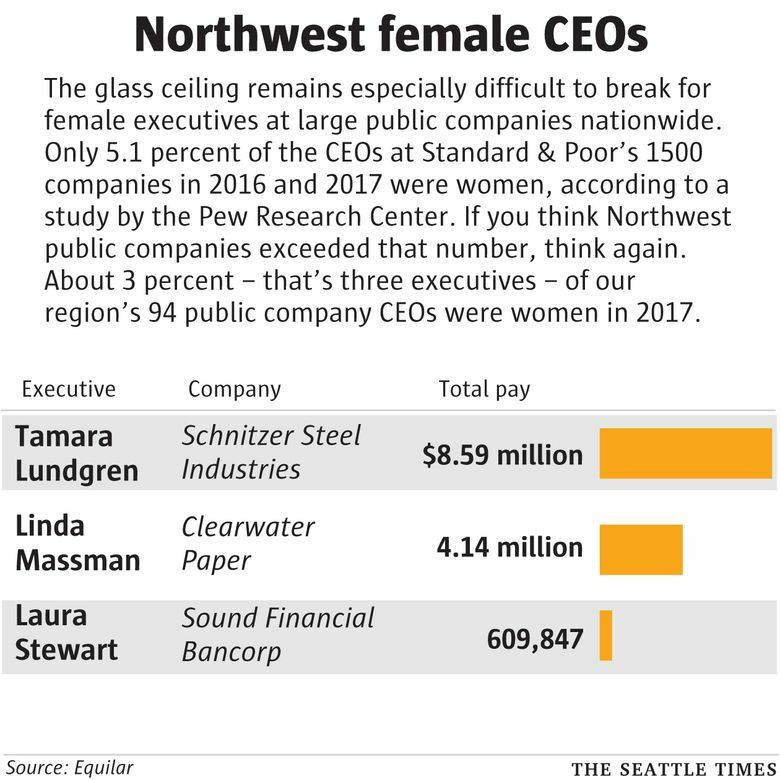 In most cases the reported compensation for the Northwest’s highest-paid CEOs largely consisted of stock and option awards, Equilar data show. Paying CEOs with stock and options tied to either performance or time on the job has become a widespread practice among public companies nationwide. 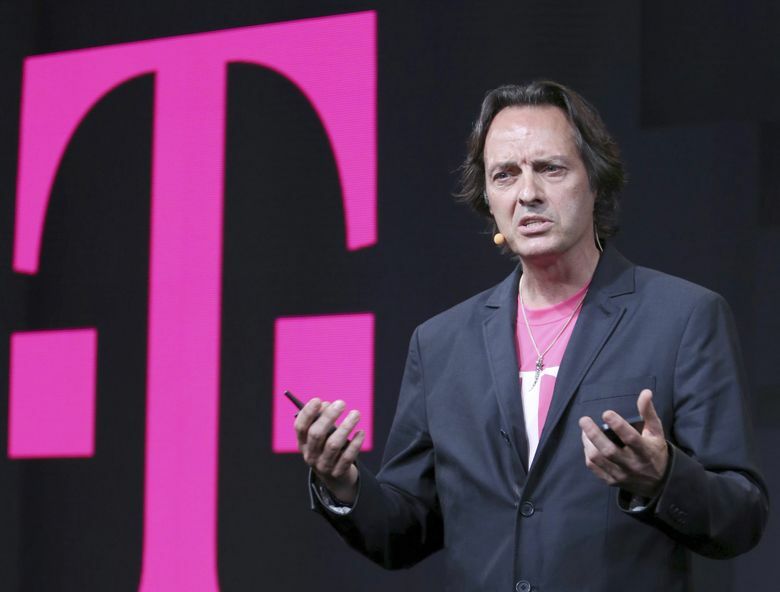 Second to Okerstrom on the Northwest public company pay scale was John Legere, president and CEO of T-Mobile US. His reported 2017 compensation was $23.63 million, although nearly 69 percent consisted of stock awards. 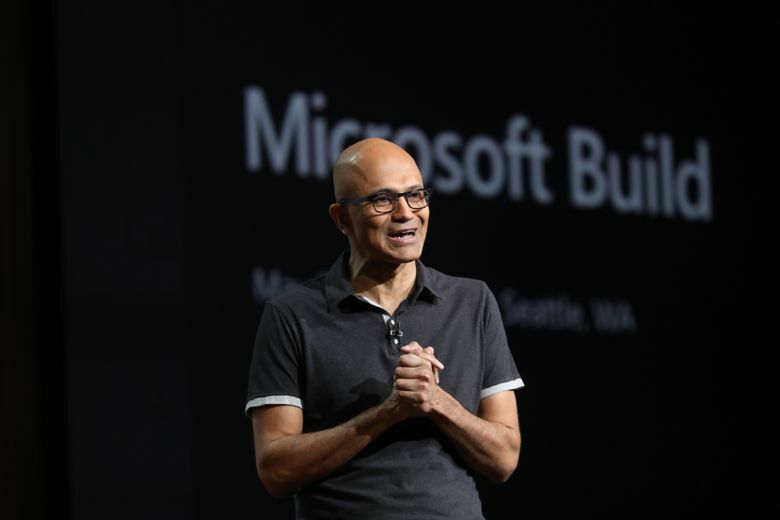 Microsoft CEO Satya Nadella came in at No. 3, with a reported compensation of $20.01 million. Stock awards accounted for 57 percent of his pay. No. 4 was another new executive, Sanjay Mehrotra, the president and CEO of Boise, Idaho-based Micron Technology. Stock and option awards made up 89 percent of his $15.37 million pay package last year. 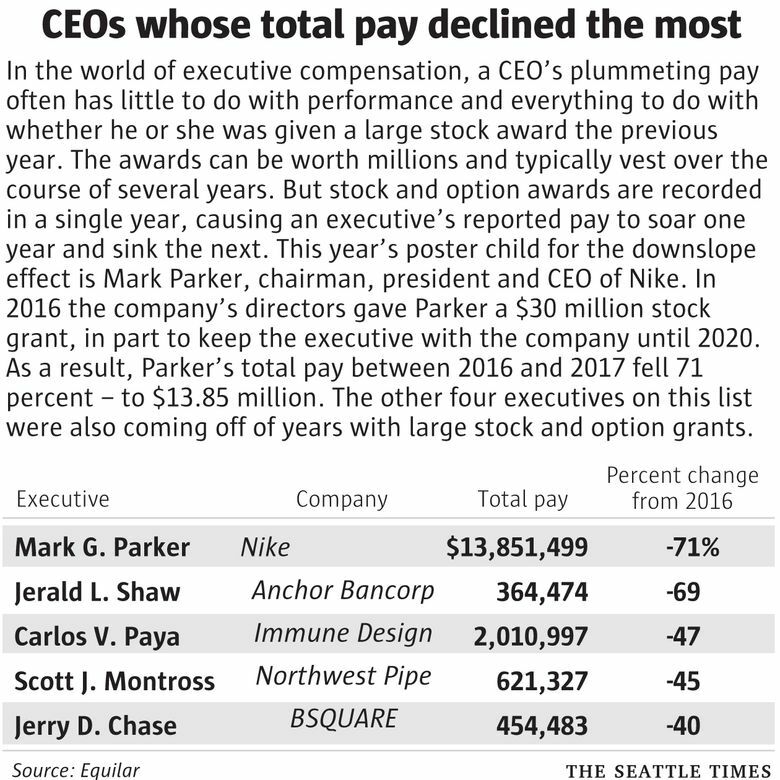 Only Mark Parker, chairman, president and CEO of Nike, had less than half of his compensation in stock among the five highest-paid CEOs. Only 36 percent of Parker’s $13.85 million pay package consisted of stock and option awards. But Parker is the exception that proves the rule. In 2016 Nike’s board awarded him a stock grant that vests over time in a bid to keep him with the company until 2020. How much was the grant? It was $30 million. One face you won’t find in this year’s gallery of the best-paid CEOs — Howard Schultz. The Starbucks leader was one of the four best-paid Northwest CEOs every year from when he returned as Starbucks chief executive in 2008 until he stepped aside as CEO in April 2017. That run included three straight years, ending in 2011, as the region’s highest-earning CEO.